DOT crews are installing a protected bike lane on Seventh Avenue between 30th Street and Clarkson Street. Markings are in place for at least several blocks of the Seventh Avenue protected bike lane, which will extend from 30th Street in Chelsea to Clarkson Street in the West Village when complete. The new southbound parking-protected route complements the northbound lane that DOT installed last year on Sixth Avenue between 33rd Street and 8th Street. This project should increase cycling on a route that was already getting plenty of bike traffic. In a 14-hour period, DOT counted 1,700 people biking at 30th Street, 2,350 at 20th Street, and 1,300 at Charles Street. It will also shorten pedestrian crossings on a wide street where parents were afraid to let their children walk. Families and faculty at PS 41 in the Village have campaigned for safer crossings for kids for years. This project partially delivers on their demands. North of 30th Street, meanwhile, Seventh Avenue still lacks bicycle infrastructure. 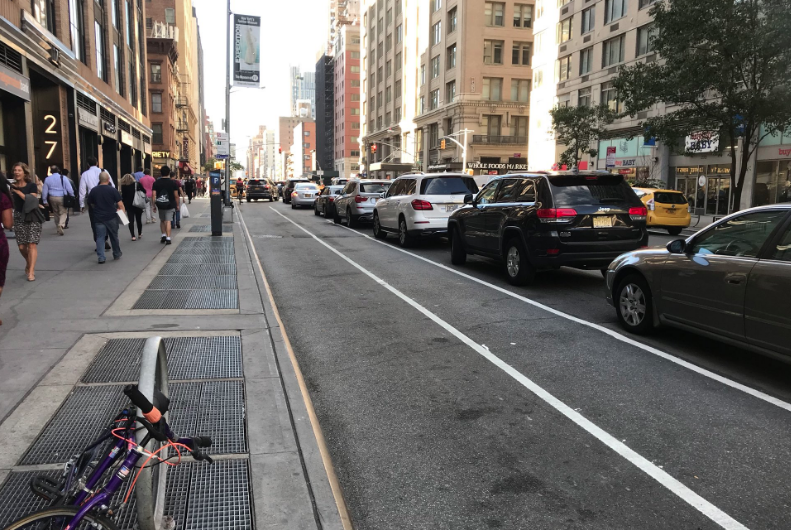 In general, DOT has held back on protected bike lanes in the heart of Midtown, but the agency is repurposing a motor vehicle lane on Seventh Avenue between 42nd Street and 34th Street for much-needed sidewalk expansions. Wider sidewalks and protected bike lanes are both essential to creating a functional active transportation network in the busiest part of the city. We should also advocate restoring the pre-existing street grid in the Village, before the atrocity of Seventh Ave was unleashed upon the area. The Seventh Avenue protected bike lane now extends to the West Village. DOT installed the first leg of parking-protected bike lanes on Seventh Avenue from 30th Street to 14th Street at the end of last year. The southern segment cuts through the irregular angles of the West Village grid between 14th Street and Clarkson Street. DOT aims to install a protected bike lane on Seventh Avenue from 30th Street to Charlton Street by the end of the year. Agency staff presented a portion of the project at last night's Manhattan Community Board 4 transportation committee meeting. Last night, DOT presented the southern segment of its plan for a Seventh Avenue protected bike lane, from 14th Street to Clarkson Street [PDF], to the Manhattan CB 2 transportation committee, which voted for it unanimously. One of the scariest stretches in the Manhattan bike network - the gap in the Second Avenue bike lane approaching the Queensboro Bridge - is in line for safety improvements from NYC DOT.